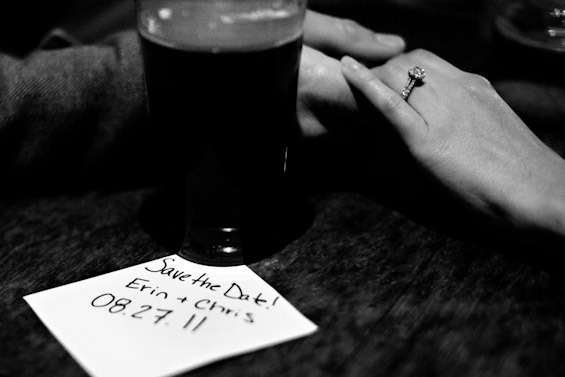 A relatively new concept in Ireland, engagement shoots have blown over from our American cousins and we are so glad they have! Unless you are both professional models (we all wish!) 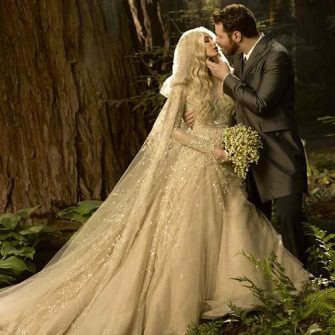 then chances are the first time your find yourself centre stage in a photo shoot will be on your wedding day; and that can make for some awkward posing! 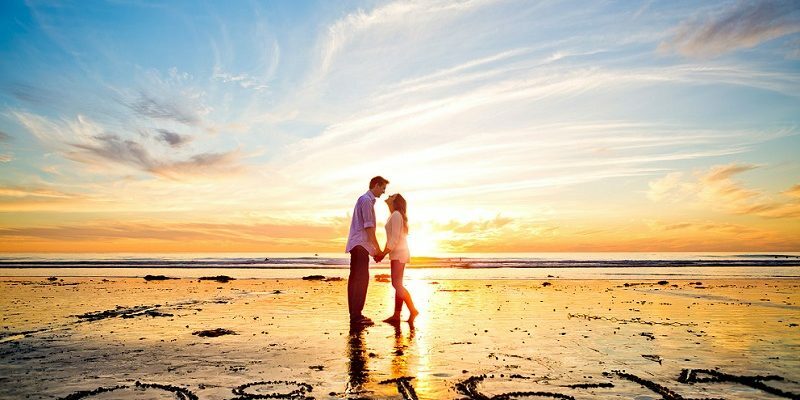 So get comfortable in front of the camera, calm your nerves and revel in the romance of being a newly engaged couple with our best places to hold your own engagement shoot! Ireland is an engagement shoot dream and it would be an absolute shame not to work with the natural beauty that God has given us. 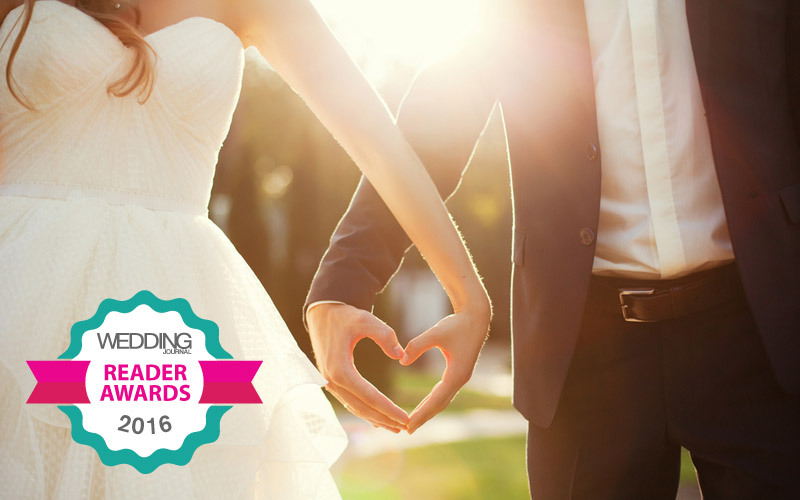 Don’t shy away from this go-to setting just because it’s a popular option; it’s popular because it works! Ireland is teaming with forestry so those searching for an enchanted woodland location have boundless options to choose from. Think country parks surrounding the Mourne and Wicklow mountains for ideal sites. Not quite a country park but we are swooning over this shoot on the Cliffs of Moher. Those dreaming of the romance and serenity of an aquatic shoot are in luck; whether it’s being photographed on a coastal path flanking the ocean, or on the beds of a hypnotising river you’re never far from water in Ireland! The cascading backdrop of a waterfall can also provide the most dramatic of of locations. Urban photography is a huge trend at the moment and if you’re an urban kind of couple then a city centre shoot is for you! 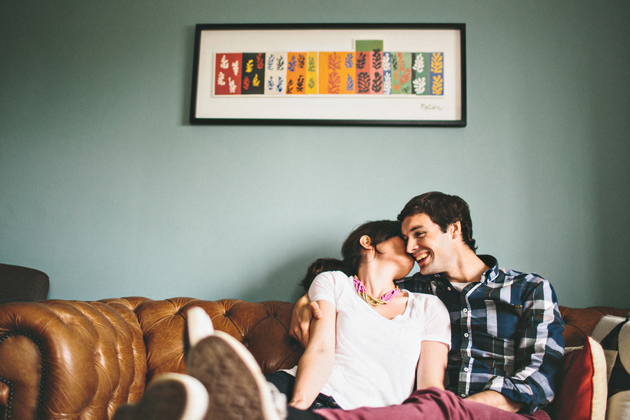 Think adorable side streets, cuddling up in doorways and statement signs! Use the city as your decoration and include the magnificent architecture Ireland has to offer. 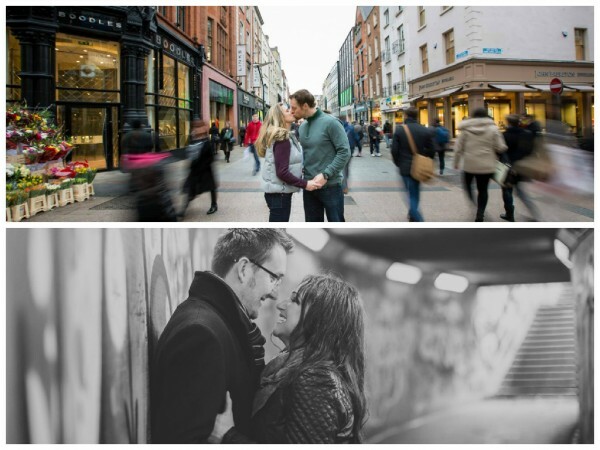 Below are two excellent examples of inner city engagement shoots in Dublin and Belfast. Don’t be afraid of the typical Irish weather either, the couple embracing in a Belfast subway are drenched but look how much fun they’re having! So you’re not the kind of couple who usually hang out in forests and your friends would be more likely to find you in the pub on a Saturday afternoon than on a scenic walk? Don’t do an engagement shoot anywhere you feel uncomfortable because you think it’s expected. There are no rules! Take the shoot to the pub and even include your friends; the more the merrier! Believe us, even the photographer would love a pint! 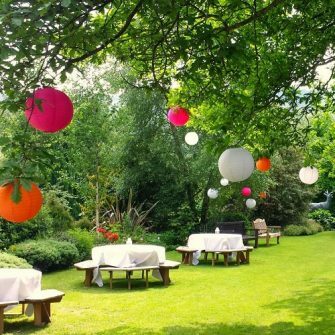 Fancy something a bit different? Coffee shops are the perfect way to get some sensational, natural shots of the two of you just hanging out. Landmarks make amazing engagement shoot backdrops as they can really reflect the couple’s personality. 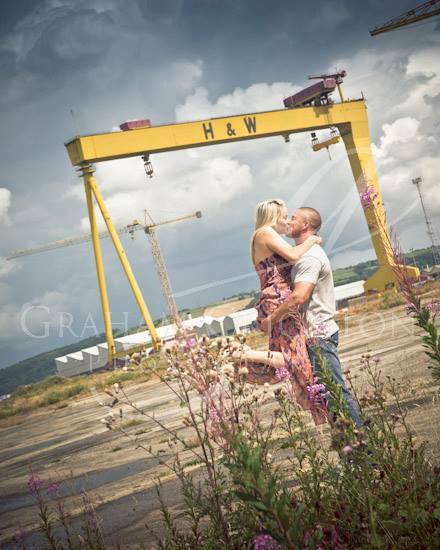 For instance, if you met and fell in love in Belfast, what better way to celebrate the city than an engagement shoot flanked by Harland & Wolff? Plus your photos will also have that stunning, contemporary, industrial vibe. Bonus! If you and your partner are regular homebodies that rarely fly the nest, pull up a pew and stay right where you are! For some lovely, candid shots cook up a storm in your own kitchen or relax by the fire! You will naturally be less self-conscious in your home and the props- think of the props! Not strictly in Ireland but newly engaged Iliana and Joe from Ocoee, Florida chose to hold their engagement shoot in their local gym. As crossfit fanatics, the Bride told Huffington Post, ‘On the days we have off together, this is what we look forward to doing together.’ Whatever floats your boat. 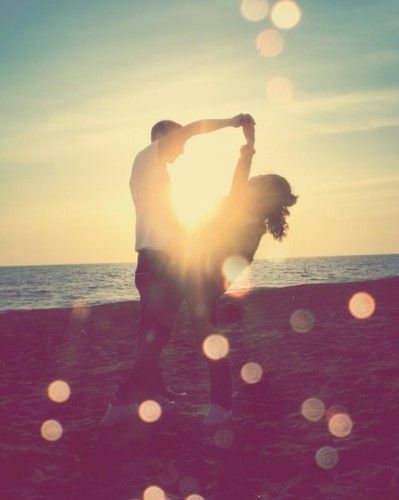 Maybe your inner peace isn’t found at the gym but why not chose your own favourite place as a couple? 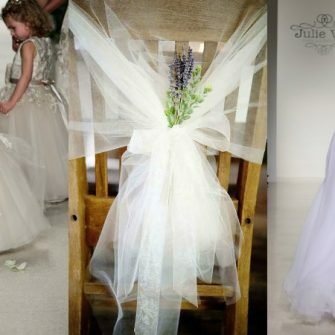 Don’t be afraid to broach an unusual idea with your photographer. Photographers love finding creative ways to showcase their talent and they’ll be excited to try something new.